The strength and rigidity is on the back of the unit, and that’s the first thing to look at in kitchen carcases. 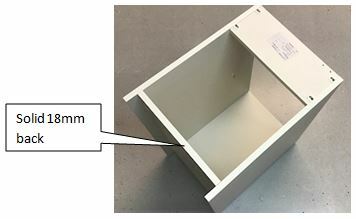 You will recognise low quality cabinets at once by the thin 3mm, 6mm or 8mm hardboard backs. Our cabinets are constructed with solid 18mm backs giving extra strength, rigidity and longevity. Look out if the units have been assembled using screws, which is a HUGE cut on quality, strength and precision of the assembled cabinet. Furthermore, some screws are visible from the outside, spoiling the look of the finished product. Don’t waste your hard earned money buying these units if you are serious about quality! 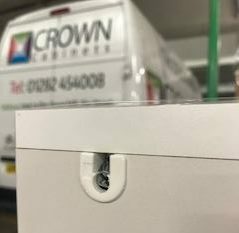 Our units are assembled using the Rafix connector system which gives extra strength and durability to the carcase. The connectors are located in such a way to ensure they are not visible after installation. The edging on a unit is far more than just a decoration to make it look good. It’s there to protect the front edges from the damage that’s inevitable when you’re frequently using the units. In addition, a good quality edging will protect the units from moisture seeping in. Poorly made cabinets will have cheap melamine edging normally stuck on using an Iron, which isn’t going to offer much protection. 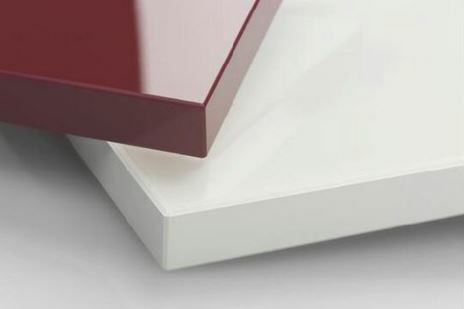 Good quality units should have edging of between 0.4mm and 2mm edged using computerised Edge Bander which is programmed to apply the precise amount of glue at the right temperature and trimming to give a perfect smooth edge. Our units come with 2mm PVC edging applied using our state-of-the-art computerised Edge Bander. Our cabinets come with drilled holes to help fit doors with ease and prevent possibility of damage during fitment. 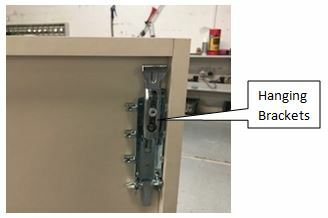 Door hinges are not cheap and to save cost, some manufacturers use low cost hinges. These can give you real problems with adjustments, snapping off, slam shutting and inadequate opening angles of the door. Our kitchen cabinets come with quality Hettich soft-close hinges and ArciTech drawer system boxes as standard. When visiting showrooms we advice you check if the colour of the doors and cabinets are similar. Some manufacturers only offer few cabinet colours (mainly white) and then fix doors with a different colour (this is not be confused with some kitchens or bedrooms where the contrast in colour is intentional as a choice). We bring you extensive range of cabinet colours to match the preferred door colour of your choice. Our cabinets are specially designed to conceal wall hanging brackets out of sight, to ensure your kitchen has a stylish finish. 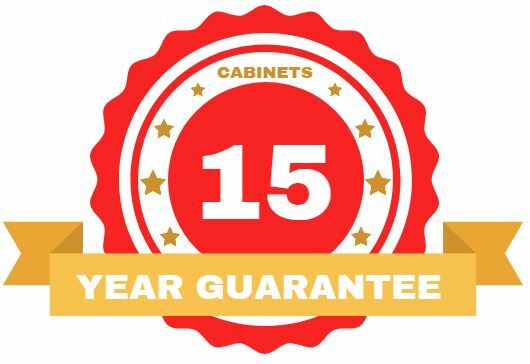 We are so assured of our well-built quality, strength and rigidity of our cabinets that we offer 15 Year Guarantee on all our cabinets, which are manufactured in our own UK factory. All our operations are run centrally from one location, thus giving us the advantage of closely managing the finer details. We use new and modern computerized machinery to produce our cabinets with the perfect precision and finish. We’re happy to explain what we do and how we do it, because being open with our customers is part of the reason why a lot of our business comes from returning customers and recommendations. 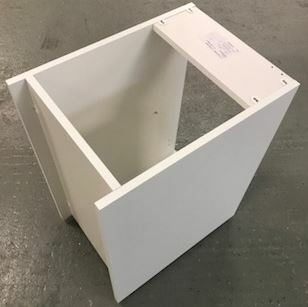 All our cabinets are made to order in good time, delivered direct to the site on the date agreed with you as fully assembled rigid carcases, alleviating the hassle associated with flat packs. Although flat pack carcases are cheaper initially, it’s important to factor in the cost of assembling the units. If you’re not going to do it yourself, the cost of labour can soon add up, particularly if parts are missing and your fitter has to find replacements. Our fully assembled rigid cabinets will save you valuable time and effort when you come to fit your new kitchen. We use competent and qualified specialists to carry out any electrical or gas work safely to ensure we comply with the regulations and you remain safe. When we have completed the installation we’ll ask you to look over the work and make sure it is completed to our exacting standards, leaving you to enjoy your stunning new furniture for many years.